The true measure of a champion isn't measured by how he reacts to victory, but how he deals with the tougher times. At last September's Mr. Olympia, Hide Yamagishi was in the shape of his life and looked well on track to being in the coveted top ten, as he had been the past three years in a row. But inexplicably, the judges relegated him to fifteenth place - a decision that left many scratching their heads. Many athletes would have been depressed, frustrated, or felt angry and slighted. Not Hide. He picked himself up, dusted himself off, and got right back to work in the gym. Now he's back in prep mode for the upcoming 25th edition of the Arnold Classic. With the help of his team and the support of Gaspari Nutrition solidly behind him, Hide is getting ready to show us the best version of his physique the world has ever seen. RH: What do you remember the most about the first Arnold Classic you competed in back in 2007? HY: It was very unexpected. I had not been invited, and I wasn't planning on being there. But at that time, Mr. Lorimer and Mr. Schwarzenegger would give special invitations at the last minute to outstanding athletes they saw in the first show of the season, the Pro Ironman. In 2007, I did that contest, but they chose Silvio Samuel. The weekend after that, I got third at the Sacramento Pro and got invited shortly after that. The Arnold was the following weekend. We were both being coached by Milos Sarcev at the time and had trained together, so it was exciting that we both were suddenly competing in the Arnold Classic for the first time. It was a great experience, but my condition wasn't good enough. I had peaked for the Ironman and faded a bit in Sacramento. I faded even more by the time of the Arnold, then I went on to Australia the next weekend - four contests in four weeks! That was a crazy month, but I learned a lot. I said to myself, the next time I compete at the Arnold, I'm going to be in much better shape. It was three years later, but I did do that in 2010. RH: You didn't compete in the Arnold Classic in 2011 or 2012. Why did you skip those two years? I know it's an invitation-only event, but I had assumed you always get invited? HY: I wanted to compete, but those were both times when my focus was on putting on more quality size overall and bringing up certain bodyparts. 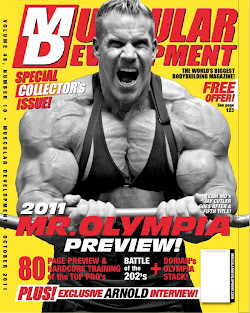 I needed good off-seasons to do that, and I had done the Mr. Olympia in both 2010 and 2011. That would have only given me not even two months for an off-season before I would have needed to start getting ready for the Arnold again. Sometimes we want to do certain shows, but the timing just isn't ideal. RH: With the help of Iris Kyle, you came into the 2012 Mr. Olympia in what I and many others feel was the best shape of your career. Are you working with Iris again for the Arnold? HY: Yes, I very much enjoyed working with her last year and I was so happy with the results. I knew I wanted to continue. RH: How is Iris's approach to contest prep different from what you did on your own, and what you did with Neil Hill? HY: The main difference is really just eating more food. Iris has me eating more than I ever did before on diets. In the past I wouldn't have believed I still could get in my best shape with so much food - as in 300 grams of protein and up to 500 grams or more of carbohydrates a day. But it worked. RH: What are your main goals for the package you want to bring to the Arnold, compared to how you looked at the Olympia? Are you hoping to come in bigger but with that same incredible condition? HY: Yes, exactly. I don't know if bigger is really the right word, I think 'fuller' is really what we're planning on. Because it was the first time we had worked together last year, we didn't really know how much food I could eat. Now we see I can eat even more and be that much fuller. RH: Have you made any changes to your training since the Olympia? I know your workouts are always different, but have you been focusing on any new exercises or using any new techniques? HY: My trainer is Eric Dilauro, and he's very good at constantly mixing up the workouts. We never do the same exact workout for any bodypart, ever. He switches up the exercises, the order we do them in, the rep range, the rep tempo, and so on. One thing that has made my training much better in recent months is that I don't have any injuries. Anyone who has been training for over 20 years like I have will get little aches and pains that are manageable, but finally my hip injury from 2010 is almost completely gone. The only time I really feel it anymore is on squats, so I don't go as heavy on those as I used to. But overall, I can't complain at all. I'm turning 40 in June, and I never expected to be feeling this good at this age. You hear all these guys who aren't even 40 yet complaining about their backs, their shoulders, their knees, their elbows - so I am very grateful to be feeling good! RH: You've competed so many times now, I have to wonder - is dieting still just as hard as it's always been? Do you still have food cravings and get really hungry? HY: It's never been easy, but I have done it so many times that it's routine to me. The last four weeks are the only time I start feeling hungry and tired. That's when you have to diet the hardest to get rid of the very last bits of bodyfat that your body doesn't want to give up. When you see someone with striated glutes, you know they suffered and paid the price to reach that condition. Nobody gets into that condition easily. I sure don't! RH: As competitors, we usually keep an eye out for any new supplements that can give us an edge. Are there any newer Gaspari products you will be using for the first time this prep? HY: Not for the first time, but I am combining products I never did before, like Vasotropin and Glycofuse, that are allowing me to stay so much fuller than ever before. I also increased the amounts of Aminolast and Glycofuse I take, and the results have been awesome. Glycofuse is an amazing product. I take 2 scoops of it before I train and 2 during the workout, and the pumps are crazy. The great thing is that there's no bloating at all. That's important for anything you drink before and during the workout. RH: I know you were one of the athletes who was filmed for the documentary Generation Iron. How were you selected, and how did the filming go? HY: I got a call over a year ago from the producers, and they told me about the movie they were planning to make. They chose the top guys like Phil, Kai, Branch, and Dennis Wolf, but they selected me because I am unique. I am the only Asian bodybuilder who has competed in the Mr Olympia. They came out to film me both when I was getting ready for the Tampa Pro show and again later when I was preparing for the Mr. Olympia. I've done videos for Gaspari and MD before, but a video crew is small compared to a real film crew. There were always anywhere between 7-10 people around me at all times, with the sound, the camera, the lights, and so on. To be honest, it was very distracting and I couldn't stop feeling nervous. I found it very hard to focus on my workouts with all that going on around me. But overall, it was a great experience and I am happy to be part of it. RH: There are hopes that this movie will be the next Pumping Iron and really give mainstream people a taste of the dedication that goes into being a pro bodybuilder. What do you hope comes out of this movie in terms of how we are perceived? HY: I just want people to see how hard we work and how dedicated we are. I think a lot of people still think bodybuilders are dumb or that our physiques come out of a bottle. When they hear us speak and watch how hard we train, I hope they start to understand us better and maybe have more appreciation for what we do, even if they don't really have a big interest in bodybuilding. RH: I saw on one of your tweets that you are going for the Most Entertaining Routine award at the Arnold. What are you doing to make sure you win? HY: I've been practicing a lot, and I started working on my routine much earlier than usual. I consider the posing routine my best opportunity to show not only my physique, but to communicate who I am and the passion that I have for bodybuilding. The only other guy in the contest I think might be tough to beat is Darrem Charles. We have totally different styles. I like the slow, classical style and he does more dancing and popping and locking. RH: I appreciate the entertainment aspect of the dance type routines, but personally I much prefer your style. In fact, I would say the two best posers in the sport today are you and Dennis Wolf. RH: This isn't just the Arnold Classic, it's the 25th anniversary of the event. Does that make it any more special for you? HY: Of course! I am sure there will be a lot of special things going on all weekend and especially at the Saturday night finals to celebrate the anniversary. To be there as a competitor with all that going on will be a lot of fun and something to remember. RH: Not only is this the 25th anniversary of the Arnold Classic, but Rich Gaspari is going to be the recipient of the Lifetime Achievement Award. Why do you think he deserves that honor? HY: We can both think of many reasons, I am sure. Rich was the first winner of the Arnold Classic, and he is one of the few who went on after retiring from competition to become even more successful in business. Rich has been a big part of the industry for almost 30 years now. I talked to him about this at the Fit Expo last weekend here in LA, and he feels very honored that they chose him to receive this award on the 25th anniversary of when he won the first Arnold Classic. RH: What are your main goals for the 2013 season? When you look back at it this time next year, what do you want to have accomplished? HY: My two main goals for this year are to win another show, and to qualify for the Mr. Olympia where I want to get back into the top ten. So far I have only won one contest, and I want to feel that again. I will be doing more shows this year too. I'm already committed to the Arnold Classic, the Arnold Classic in Brazil, the New York Pro, and the Chicago Pro. I might also do the FIBO Power show and the Australian Grand Prix, plus a couple contests after the Olympia. Really, I just want to keep doing the best I can.